Aquaman #41 Review – AiPT! 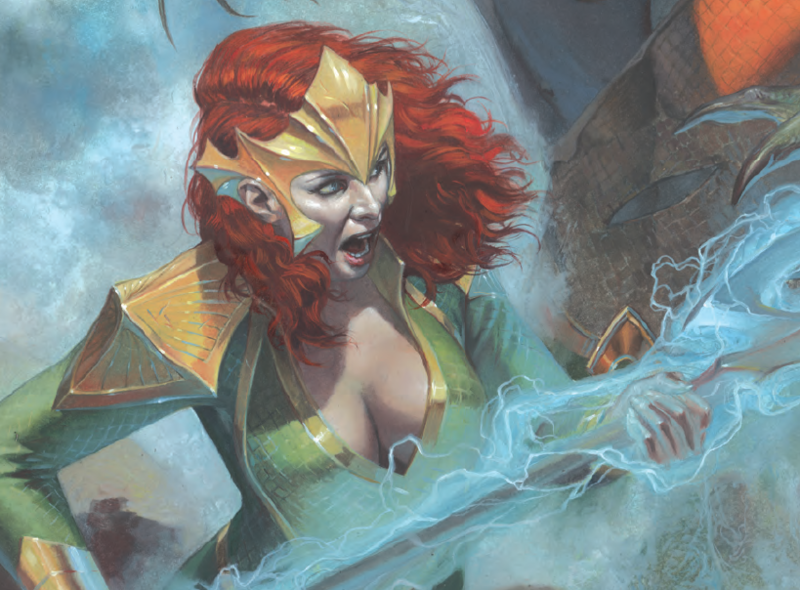 A strong Mera-focused issue that reveals her importance in the ‘Drowned Earth’ event. The “Drowned Earth” event is getting a clean setup this week here and in Justice League, and things are not looking good. This issue shines a light on Atlantis and Mera’s part in the event, and just how important she’ll be in saving the day. Aquaman is missing–and the world has gone to hell! With Arthur imprisoned by Black Manta, Queen Mera is left to deal with the arrival of an alien armada aiming to punish the Earth for the sins of Atlantis. As the cosmic tides begin to rise, Mera finds herself in a fight for her very life when the flood unleashes new horrors of the deep! If you’ve read Justice League #10 (and you should read that first) you’re going to be so hyped to read this. I read JL first and couldn’t wait to see the story unfold a bit further. This story also involves Batman and raises the stakes since he’s very much at a loss on what to do. This issue doesn’t necessarily need Justice League #10 to understand what is going on, but it certainly helps add to the tension and stakes. Aside from a bit of retread with Justice League checking in on Aquaman, this issue reads like a disaster movie. Atlantis is now above ground thanks to the events in Dark Nights: Metal, which is a bit of a blessing as floods come storming in changing the people into monsters. Mera must use her powers beyond what she normally does to keep these poisoned waters at bay. Like in any disaster movie things don’t go well and you’ll cringe as Mera does everything she can to stop the inevitable. Batman cuts into the story briefly to add some context as far as the threat Mera is dealing with, but it’s also a nice reminder of how important Mera is to the Justice League. Seeing what happens to Atlantis in this issue, and how much is lost, further shows how high the stakes are with this event. Abnett writes Batman in such a way that will further your respect for Mera, which continues to trend the character in a top-tier superhero way. The art by Lan Medina, with colors by Gabe Eltaeb and inks by Vicente Cifuentes, is very sharp that has a Brett Booth look that suits this series (since he drew so many!). There are many extreme close-ups–including of Batman–which help intensify the gravity of the situation. The issue never loses track of the humanity of its characters and the deep fear they’re going through as the world floods. One element that’s missing is any focus on Mera’s arrogance in her acts of holding the poison at bay. As the leader of her people she should have had contingency plans in place, but instead seems to be more than willing to just hold the flood at bay forever. It requires Batman explaining plainly how futile that plan is, which reduces Mera’s standing as a leader ever so slightly. There’s a missed opportunity to play her arrogance up in these acts. A good disaster-movie story highly focused on the heroes and their humanity as all is lost. Read this one after Justice League to get an extended story before “Drowned Earth” really kicks off next week. Mera shines through and may be the DC universe's only hope as doomsday comes to us all.